Clear front!, originally uploaded by CircadianReflections Photography. I went out for a couple hours last Sat. 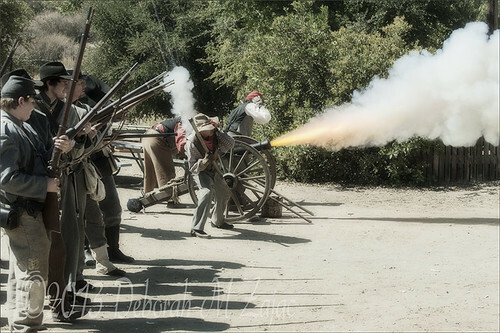 to hang out with a friend Rainey and photograph a Civil War Re-Enactment. It was a great venue; we were pretty close to the action. This is one of two shots I got with the flame coming out of the cannon. Timing is tricky. I am thrilled that I also got sparks flying from the flint or what ever it’s called where they light the cannon. Clear front is what one of the crew yells when the flint is ignited and soon after that it’s BOOM!